2. 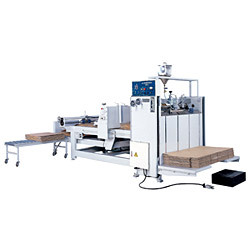 Squaring hopper that operates after gluing surely makes out the correct boxes without distortion and discrepancy under any sheets feeding speeds. 3. Feed table can raise and lower with power-driven. To make paperboard's top surface and entrance have the same level, easy to feeding. 4. Motorized adjustment of stop plate according to the boxes size on the squaring unit. 5. The machine is made out compactly and it is possible to set it up at a limited space. 6. As this machine is combined with the counter ejector that quantity of bundle can be pre-set, you operating effciency is all the better. 7. Gliding-head is easy to tack off and set up, so that clearing-work is very convenience. 2. MAX. sheet size: 1350 x 1500mm. 3. MIN. sheet size: 240 x 260mm. 4. MAX. glue lap: 45mm. 6. Total power: 3 3/4 HP.